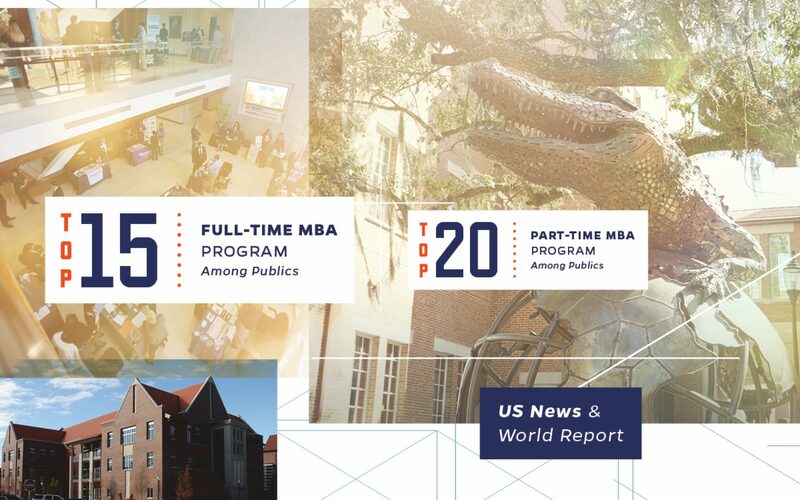 GAINESVILLE, Fla. – UF MBA at the Warrington College of Business’ Hough Graduate School of Business was once again honored as a top 20 public full-time and part-time program in U.S. News & World Report’s “Best Graduate Schools 2019” rankings. The UF MBA full-time program made an impressive jump to No. 14 among public schools, up five spots from last year’s No. 19 position. Overall, the program rose to No. 34, up six places from No. 40 in the “Best Graduate Schools 2018” rankings. The full-time program ranked No. 6 among publics for student selectivity. The student selectivity rank measures students’ average GMAT and GRE scores, average undergraduate GPA and the school’s acceptance rate. UF MBA is second among public schools, following the University of California – Berkeley, for acceptance rate, selecting the best and brightest students for its full-time program. UF MBA’s full-time program also ranked No. 14 among U.S. public schools for starting salary and bonus, topping off at $115,510 in 2019. UF MBA graduates’ starting salary and bonus amount have been steadily rising for eight years, resulting in a 72 percent increase from 2011 through 2019. UF MBA also placed in the No. 11 position among publics in the percentage of graduates employed at graduation category, with about 80 percent of graduates having received a job offer at the time of graduation. The UF MBA part-time program again placed in the top 20 among U.S. public schools, ranking in the No. 18 position. Overall, the UF MBA part-time program ranked as the No. 30 school. UF MBA is the only program ranked in the top 35 of both full-time and part-time programs in the state of Florida, which was recently ranked as the best state for higher education by U.S. News & World Report. U.S. News & World Report determines the top graduate business schools through a combination of objective measures including placement success, student selectivity and a reputational assessment. All 480 MBA programs accredited by the Association to Advance Collegiate Schools of Business International were surveyed in fall 2017 and early 2018 to determine the “Best Graduate Schools 2019” ranking. UF MBA has been prominently ranked by other leading publications, including the No. 5 full-time program among U.S. publics by The Economist and Eduniversal, in addition to the No. 13 program among publics by Financial Times and No. 24 program among publics by Bloomberg Businessweek. Offering a progressive curriculum and delivering cutting-edge concepts in areas of greatest demand from employers, UF MBA provides an unmatched educational experience. UF MBA offers three Full-Time options, and six part-time options within its Executive, Online and Professional programs. UF MBA also offers 100% tuition scholarships for qualified applicants starting in the 2018 application cycle. Scholarships will be awarded to cover tuition and fees for in-state and out-of-state qualified students admitted to the full-time program. Learn more information about the 100% tuition scholarship. Will Dropbox be the unicorn that proves itself?